The oldest "relation" we've found so far is a 12th Century German Lord. Any genealogists researching the names Wiemer, Hahn, Kugland, Schneller, Pfule / Pfuel / Pule, Schoeckh, Gueffroi in Salzburg or Prussia ... or Rigby, Brookfield, Brade, Parry, Woodcock in Liverpool, Shrewsbury or Wales ... are welcome to contact me (I would say Jones, Lloyd, Evans and Davies too, but there are rather a lot of us!). Better still, however, search on GenesReunited, as I have uploaded most of our records there (3000+ people; 18+ born before 1700, 148+ before 1800). 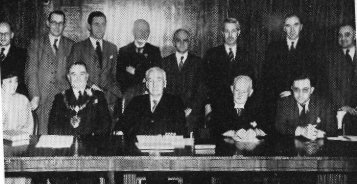 My paternal grandfather, Dr Thomas Jones, CH was once described as "one of the six most important men in Europe". Click on the link for more details on his life, and about a commemorative event in Rhymney in October 2005. I gave a talk on him at the Sixth John Briggs Memorial Lecture; a video recording was made by Dudley Hubbard, but we've yet to obtain a copy. His daughter — my aunt Eirene, Baroness White of Rhymney — was a Labour peer and had a distinguished political career: for details see her obituary in The Guardian, The Telegraph and The Times, as well as the Wikipedia entry linked above (The Times also had a notice of death and later one of her memorial service). Gregynog Press produced a 30 page tribute to her; Cardiff University also had a tribute; and the National Library of Wales has a photo of when she was first elected. Her brother — my father, Tristan Jones — was Manager & Director of The Observer (despite what some sources say, he did not phrase it as 'Managing Director' nor was he the Editor). He was also a prolific collector of antiques and curios; his collection of commemorative ceramics (sold in 1991) was apparently the world's largest. 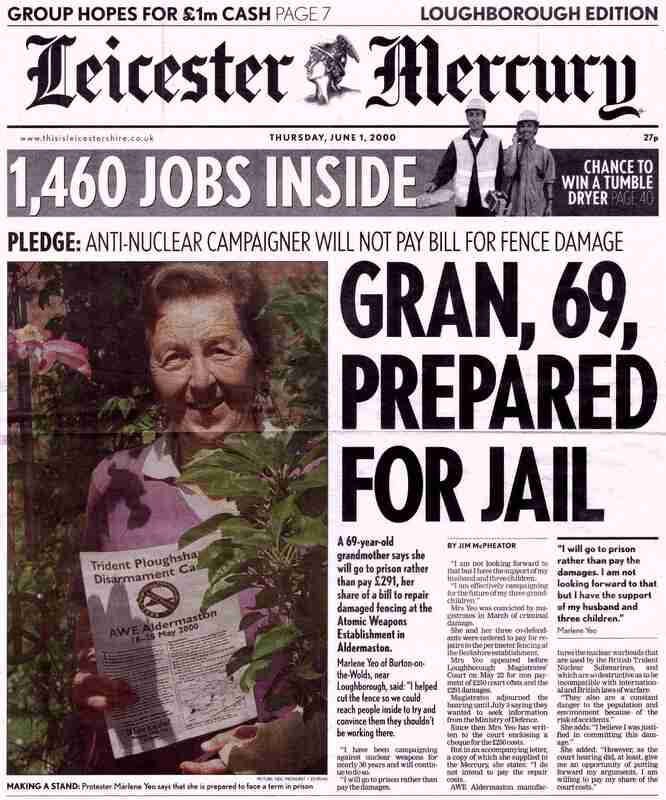 My aunt, Marlene Yeo, has had a distinguished career as an anti-nuclear campaigner. 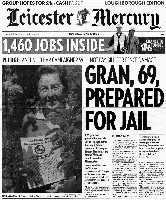 Click on the image at left to get the full picture (262K), or here for the Leicester Mercury's own abbreviated text version. Her memoirs of growing up under Hitler, in East Prussia, were published as Skating at the Edge of the Wood. She also wrote a children's adventure book, "Amina and the Moshi Makers" (pub. Longmans Arusha/Kampala/Nairobi, 1966). 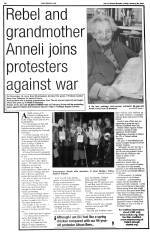 My mother, the much loved Anneli Jones, also had a distinguished career as a Green Party candidate and peace campaigner. 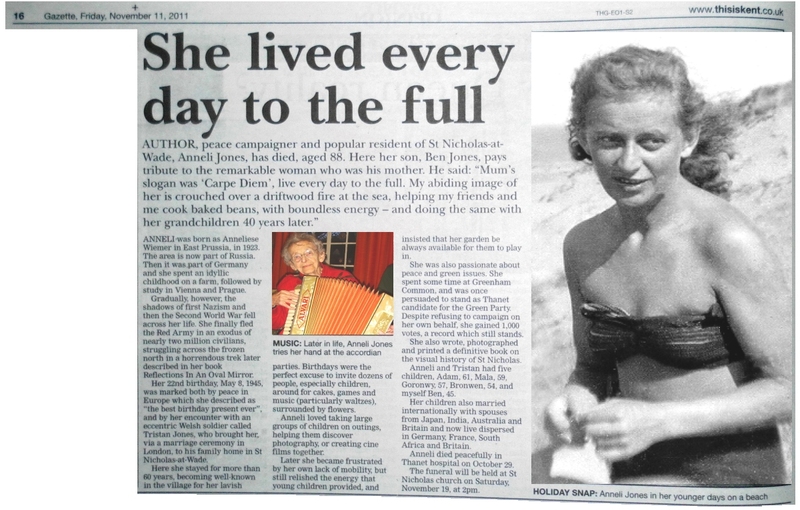 Click on the image to see a 2007 article about her in the local press. 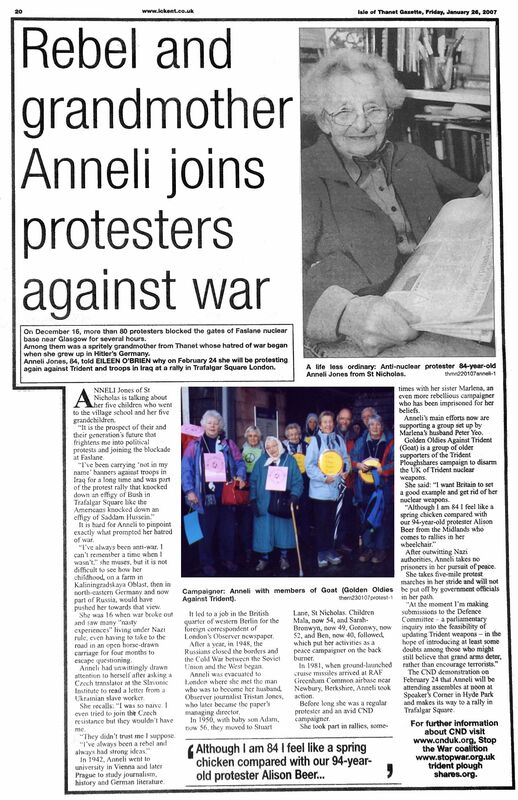 On the right is a photograph from a few years before, showing her on her way to the "2 million people" demonstration in London against the Iraq war. 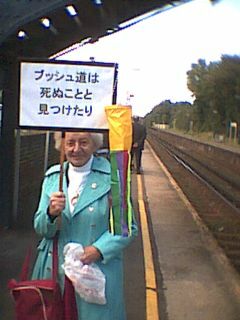 The 'funeral-style' placard she is holding bears a pun on the most famous phrase in Hagakure, the Japanese book of the Samurai. The Samurai were also known as "Bushi", and while the original says "The Way of Bushi is the Way of Death" (often phrased as "the way of the warrior is the way of death"), this version says "The Way of Bush is the Way of Death". (For those who can read Japanese, the original is: 武士道は死ぬことと見つけたり while the new version is ブッシュ道は死ぬことと見つけたり). The first volume of her memoirs, detailing her peaceful upbringing in East Prussia followed by a harrowing flight from the Red Army, is available from Ozaru Books as Reflections in an Oval Mirror. Immediate siblings & spouses include a professor of West African History, a concert pianist, aluminium window software/hardware company managers, a management consultant and a systems engineer. I myself run a translation / interpreting company specializing in oriental languages; we also publish books about East Kent, East Prussia and East Asia. We're based in St Nicholas-at-Wade, behind a famous gate with multilingual "Beware of the Dog" signs.